The first recorded opinion that I have seen in 2015 is a reminder to medical malpractice victims that there is rarely another option to hiring a lawyer in a medical malpractice case. In Bagley v. Rochester General Hospital, a woman presented to the renal dialysis unit with complaints of abdominal pain, constipation, and complications from end-stage diabetic renal disease. This was, regrettably, not a healthy woman. The hospital did some tests and sent the woman to the emergency room believing that she had bacterial peritonitis as a result of being on dialysis. The woman’s condition went downhill from there and she died of cardiac arrest. Plaintiff contends that the real problem was a ruptured acute appendicitis, not peritonitis. Let me start with a blunt statement: our law firm would never take this case. Let’s assume it is exactly as the victim’s family says. The hospital’s doctors screwed up and misdiagnosed the patient. Even if this is true — I would bet that, although it is just a hunch on these facts — I don’t think it is a viable medical malpractice action. We get calls on these kinds of cases all the time. You have someone who is deathly ill who gets end of life or near end of life treatment. And the doctors screw up the care and the patient dies. This exact scenario will happen literally many times today in this country. These people call lawyers and want to bring a malpractice lawsuit. I don’t blame them. You want to milk every last minute you can get with someone you love. Really, there ought to be some way to bring a claim in these kinds of cases. But there is not. 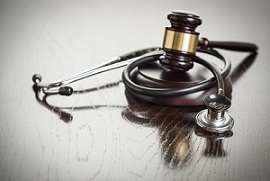 The economics of medical malpractice cases are such that it becomes impossible to justify the expense of a case. What is a case like this worth? I think 90% of the verdicts are for $200,000 or less and the average verdict would be less than $100,000. The cost of bringing a wrongful death medical malpractice case often exceeds this amount. We typically spend between $75,000 and $150,000 to take a case all the way to trial. For all that you hear about medical malpractice cases settling, these are the types of cases that defense attorneys will take to trial every time. Like I said, our law firm would not take this case and I’m surprised someone did. Curious, I googled the Rochester, New York law firm that brought the case. They list a lot of practice areas on the website. Pretty decent sized firm. But guess what? They don’t mention medical malpractice or even plaintiffs’ personal injury work. I don’t have enough information to know if the attorneys were competent to determine whether this was a case and get it ready for trial. Who knows what the history of this case was? But a good rule of thumb is that if a lawyer is not including that area of practice on a long laundry list, you should be wary.